Lana Flores, a graphic communication sophomore at the University of Houston, won first place in a national college media competition for her advertisement design for UH Dining Services. The ad was published in the spring 2009 edition of The Daily Cougar’s Green Guide special section. 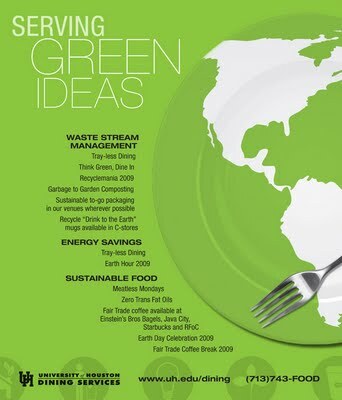 The ad, headlined "Serving Green Ideas," received a 2009 Advertising Award, First Place Display Ad, from the Associated Collegiate Press. The awards were co-sponsored by Sierra Nevada Media Group. “Lana’s achievement is representative of The Cougar’s 75-year legacy: the pursuit of excellence in the practice of the craft of publishing,” said Matt Dulin, print production manager for Student Publications. LookinGlass Media graphic design team congratulates Lana on her achievement!